As Apple only announced an entry-level $349 price tier for its upcoming Apple Watch, speculation on cost continues to run rampant, with the latest report claiming high-end gold models could sell for $1,200 when they launch next year. The Apple Watch reveal took up a good portion of Tuesday's iPhone 6 keynote, but Apple opted not to disclose comprehensive final pricing ahead of an early-2015 rollout. 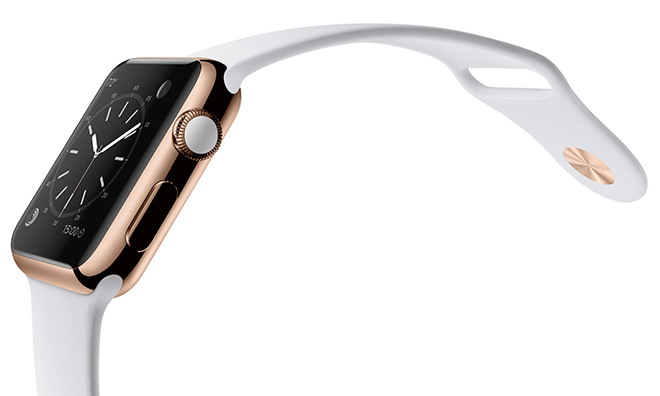 According to jewelers, however, the 18-karat Apple Watch Edition versions could run $1,200, reports TechCrunch. Unnamed jewelers offered the estimate based on dimensions taken from a set of design specs supposedly leaked last week. The report did not state which of Apple's two watch sizes was used in the analysis. The supposed price is not set in stone, as questions remain as to whether Apple Watch is made of gold or comes gold plated. Jewelers said it would be favorable to use solid gold alloy of some kind. Further, watch expert Chad Rickicki estimates an 18-karat gold version would cost Apple around $600 to craft, not including internal components or markup. The report's price point does fall within analyst Ming-Chi Kuo's prediction that Apple's wearable could priced into the "thousands of dollars." At this point, however, tacking a price on the high-end Apple Watch Edition is largely guesswork, as Apple's behind-the-scenes deals, internal component costs and other details vital to making accurate estimates are unknown. Also a wild card are the margins Apple is looking to hit with the device. When it debuts next year, Apple Watch will be offered in three "collections." The "Apple Watch Sport" lineup is thought to be the entry-level version as it comes made from aluminum and lacks an expensive sapphire cover glass. On the other end of the spectrum is the "Apple Watch Edition," which comes with sapphire glass screen and is available in "strengthened" yellow or rose gold options. Sitting between the two extremes is "Apple Watch," which also boasts sapphire glass, but swaps out gold for a polished stainless steel body.